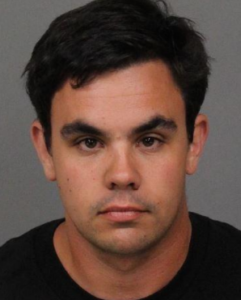 Police arrested a San Luis Obispo man on July 4th after he allegedly drove under the influence and crashed his vehicle into three parked cars. 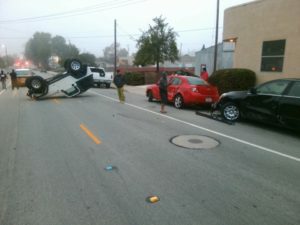 The collision, which occurred before 5:30 a.m. by Buchon and High streets in SLO, resulted in the suspect’s car overturning in the middle of the street. Officers arrived at the scene and spoke with the driver, Peter Anacabe, 25,, who was standing near the overturned vehicle. Police conducted a DUI investigation and arrested Anacabe for DUI. Officers booked Anacabe in San Luis Obispo County Jail, and his car was towed from the scene. Anacabe is no longer in custody, according to the county sheriff’s office website. San Luis Obispo police say it was fortunate no one suffered injuries in the collision. Too bad he didn’t take better care of such a beloved possession. Early start on the long road of drinking and damage. A political career could be in his future, or maybe medical examiner. I hear SLO hires only the best DUI people for that job.